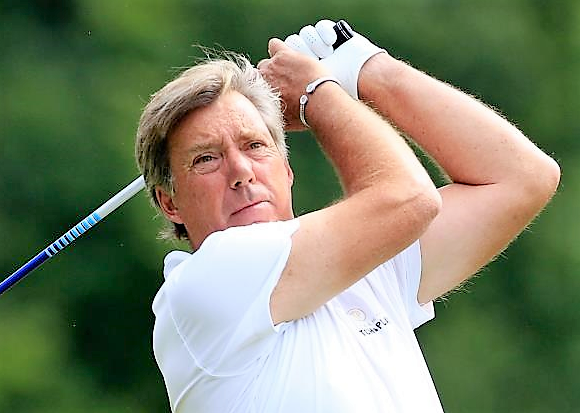 Former Ryder Cup player Barry Lane carded the lowest round in European Senior Tour history as he stormed to a four-stroke lead at the Willow Senior Golf Classic today. The Englishman fired a 12-under-par round of 60 to add to his opening round of 67 at Hanbury Manor Marriott Hotel and Country Club, moving clear of Scotland’s Gary Orr, with a 17-under-par 36-hole tally of 127. Lane birdied the first three holes and then carded four more to make the turn in just 29 shots, seven under par. He birdied the 12th hole before making consecutive gains on the final four holes, even narrowly missing an eagle chance on the 17th hole. “I don’t know how I did it,” said Lane. “I’ve shot 62 before, and 61 but that was on a par 70 course. You have no idea what you’re going to shoot when you wake up. I missed one green; I had two two-putts on the par fives so I probably only had 25 putts. 25 putts and 35 shots isn’t a bad round of golf at all. “If you shoot 12 under par you have to be holing a few putts. I holed everything within 15 feet. I had one really bad shot on 11 but I made it out the bunker and then holed the putt to keep the round going. The 57 year old carded the lowest round on the Senior Tour since Argentina’s Cesar Monasterio shot 61 at Fairmont St Andrews in 2014. Orr, who sits in second place, also carded a bogey-free round, adding to his first round of 66 with a seven under par 65. The Scot from Helensburgh parred the first six holes before making five consecutive birdies, adding two more on the front nine to finish on 13 under par. “I had a steady start with a few outside chances, but left myself a lot to do in some places,” said Orr. “I never got on a roll. I hit a good shot on 16, which was playing really tough today, I holed that and got on a run with five in a row.